On any given night this year, you may have heard the sound from concerts, movies, and special events reverberating through the downtown area. 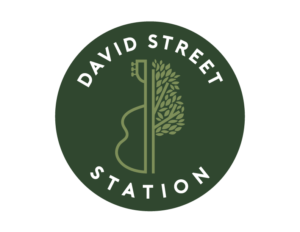 While that sound means that fun is being had at David Street Station, it also means that someone is working behind the scenes to create that feeling. Developing that great sound for the Station is a job that Brent Phillips of CJ Sound doesn’t take lightly. With over 10 years of experience mixing the right sound for the right event, Brent has been able to bring each event to life with his expertise, equipment, and natural ear for music. Brent grew up in Casper, is a father of two, and member of local touring band System Restore. While he cites that he is somewhat self-taught, much of his training has come from local Casper sound experts and mentors, Carl Jones, Paul Searcy, and Paul Hanson. Following a one-year apprenticeship with business partner and mentor Carl Jones, Brent started to develop his own methods and techniques to mix the sounds you hear through the speakers at David Street Station today. Providing equipment for each event’s sound can take anywhere from half-a-day to a-full-day’s work. 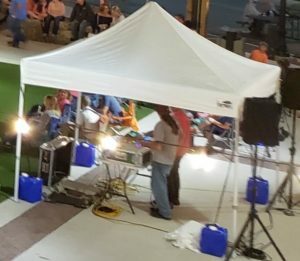 When it comes to Cinema at the Station, a few speakers are all that is needed to turn the Station into an outdoor movie theater. Other events, like the Summer Concert Series or the 5150’ Festival, require more equipment and more hands to ensure everything sound-wise will go off without a hitch. Generally, on the days of these concerts or festivals, Brent and his crew of two to four will load all of the equipment from their storage warehouse early in the morning to start setup the day of the event. Once everything – speakers, microphones, mixing boards, cables, and anything else required for the PA system – are set up, a sound check can take place. By the time all of this is done, it is show time. Choosing the right equipment for each event is something that Brent has learned to do over time and that now comes naturally. “Mixing the sound requires so many different techniques,” he says. “My ultimate goal is that everything you are hearing appears as one sound source, rather than coming from a speaker and the stage separately.” Microphones that are used for singing are not the same as those used for instruments. Additionally, certain performers prefer a certain brand of equipment, so it is important that Brent has a good stock to choose from. So now, when you hear that clear, vibrant sound coming through the speakers, you will know that someone has taken the care to ensure that what you are hearing is exactly what the performers at David Street Station want you to hear. #WhereCasperComesTogether. No Replies to "Behind the Scenes: That David Street Sound"